Experimental and clinical transplantation procedures involving hematopoietic stem cells (HSCs) are challenging because of the sparse population of stem cells in adult tissues. In addition, preclinical studies to understand basic stem cell transplantation biology such as clonal selection and the integrity and kinetics of stem cells cannot be conducted using current stem cell isolation or expansion technology. For the past two decades investigators have undertaken HSC ex vivo expansion, which has led to multiple clinical studies. No significant clinical benefit has been reported, however. As a result, it is believed that stem cell expansion technology is not optimum enough to maintain progenitor cell populations without differentiation. Increased knowledge of the hematopoietic stem cell niche, new methods to promote progenitor cell expansion without differentiation, and serum-free and animal protein free media for expanded adult HSCs may facilitate preclinical and clinical applications of stem cells. Arteriocyte’s Nanex™ Stem Cell Ex vivo Expansion System is for adult HSCs. Nanex, which was originally developed by Hai-Quan Mao at Johns Hopkins University, is a biofunctional nanofiber-based scaffold that partially mimics the bone marrow stem cell niche to provide efficient expansion of human bone marrow, peripheral blood, or umbilical cord blood derived HSCs. Nanex is prepared by electrospinning polyethersulfone fibers in nanoscale and then treating the surface with amine groups (Figure 1). The biofunctional surface together with its topographical structure facilitates the proliferation of HSCs while maintaining the stem cell phenotype in a 10-day serum-free and animal protein free culture (Figure 2). Figure 1. 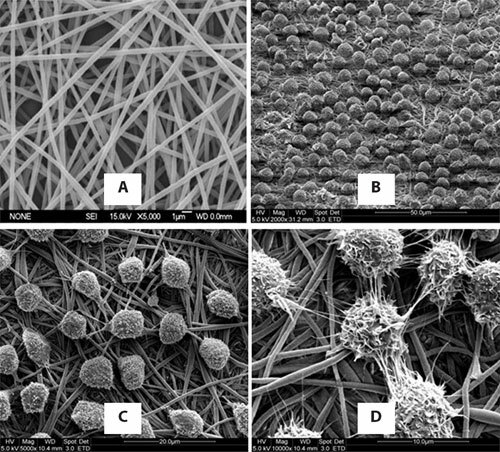 (A) Nanex fibers under scanning electron microscope (SEM): Typically the fiber diameter ranges from 300 nm to 800 nm. (B) 2,000X, (C) 5,000X, and (D) 10,000X SEM images of hematopoietic stem cells growing on top of the Nanex surface. Advantages of Nanex include that it is easily scalable to larger culture surfaces and that the cells on the Nanex surface are loosely attached, which makes the harvesting process easier, with high viability without enzymatic detachment. Arteriocyte has obtained promising results using Nanex-coated plates for ex vivo expansion of CD133+/CD34+ cells. An over 200-fold expansion of umbilical cord blood (UCB) derived HSCs was observed after 10 days of Nanex culture in a serum-free medium. More than 70% of the total cell population after 10-day expansion maintained the CD34+ phenotype. The Arteriocyte team has also demonstrated the differentiation potential of Nanex-expanded HSCs into smooth muscle and endothelial lineages, as well as reticulocytes. Nanex-expanded HSCs successfully reconstituted hematopoiesis in a NOD/SCID mouse vascular injury model at efficiencies higher than that of standard suspension culture. Further functional studies using Nanex-expanded HSCs in a rat LAD cardiac infarction model also showed a significant cardiac function improvement. This data indicates that Nanex-expanded HSCs maintain higher angiogenic and vasculogenic potential. Additional studies showed that Nanex-expanded HSCs maintained self-renewal capability for at least 5 cycles (10 days each cycle), with a total of 10 million fold expansion. In addition, it has also been shown that Nanex-expanded HSCs can be genetically modified with various therapeutic genes and growth factors. 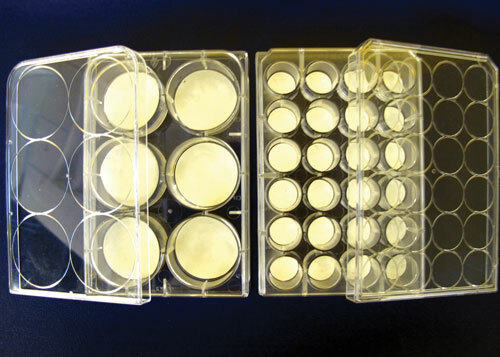 For clinical applications requiring increased cell dose or multiple injections, the Nanex ex vivo stem cell expansion system can be easily adaptable. Preliminary studies using Nanex-expanded HSCs in limb rescue showed that the mouse group injected with Nanex-expanded cells exhibited restored blood flow in the ischemic leg several fold better than freshly isolated HSCs. Arteriocyte is involved in a NIH-funded Phase I safety and feasibility clinical studies using cord blood derived Nanex-expanded HSCs for the treatment of critical limb ischemia. Another clinical opportunity is to use Nanex-expanded cells as a more cost-effective alternative for hematopoietic stem cell transplantation (HSCT). Initial clinical observations of decreased graft-versus-host disease following human UCB transplantation prompted greater investigation into UCB cells as an alternative source for bone marrow transplantation. A problem unique to UCB transplantation is the limited availability of original donor lymphocyte or HSCs for multiple infusions. Recent UCB transplantation clinical studies showed that engraftment can be achieved in adult patients but is delayed compared with unrelated bone marrow due to limitation in number of HSCs infused. Furthermore, the cell dose (either nucleated cell/kg or CD34+ cells/kg) correlated with clinical outcome in most studies. Therefore, alternative strategies have been developed to improve these outcomes such as the use of expanded, pooled, or sequential UCB-derived HSCs transplantation with nonmyeloablative or reduced intensity conditioning regimens. Alternative strategies were often ineffective as patients developed mixed lymphocyte reaction. The Nanex-based stem cell expansion system for transplantation for hematological malignances and metabolic disorders can address these challenges and provide an attractive option for HSCT. Arteriocyte has also been developing Nanex technology to produce packed red blood cells (RBCs), which will ultimately supply O-negative packed red cells for blood transfusion. Recent studies on the effects of blood that has been stored for longer than 14 days indicated increased risk of organ failure. Although the available supply of both whole blood (WB)/RBCs and non-RBC components was sufficient to meet overall transfusion demands, concerns about blood supply adequacy in the U.S. remain. One of the reasons is the shrinking margin between allogenic WB/RBC supply and demand. Recently, Arteriocyte successfully demonstrated that a total of 35 million erythrocytes can be produced from a single Nanex-expanded HSCs. This data indicates the utility of Nanex stem cell expansion technology for a large-scale production of packed erythrocytes. Although still in the early stages of development, with a lot of technical challenges remaining to be solved, we envision a fully closed, portable automated bioreactor that can produce packed RBCs continuously. Eventually we anticipate that the large-scale production of red cells to replace blood donation will be a reality and not science fiction. Arteriocyte’s Nanex stem cell expansion technology can advance various research and clinical opportunities in the stem cell industry. The company is actively pursuing additional applications using Nanex-expanded stem cells including cell-based drug screening and hematopoietic stem cell transplantation. Ramasamy Sakthivel, Ph.D., is vice president of R&D, and Yukang Zhao (yzhao@arteriocyte.com) is senior manager, new product initiatives, at Arteriocyte.